As much as half of the energy used in your home goes to heating and cooling. So making smart decisions about your home’s heating, ventilating, and air conditioning (HVAC) system can have a big effect on your utility bills — and your comfort. Replacing your old heating equipment with new, energy-efficient models is a great start. But to make sure that you get the best performance, the new equipment must be properly installed. One Guy HVAC offers heating and furnace services in the Denver and surrounding areas. We are highly trained installers and repair technicians with over 20 years of experience. Just as a tune-up for your car can improve your gas mileage, a yearly tune-up of your heating and cooling system can improve efficiency and comfort. Maintain your equipment to prevent future problems and unwanted costs. Keep your heating system at peak performance by having One Guy Heating and Air Conditioning perform annual pre-season check-ups. We get busy once winter comes, so it’s best to enroll into a One Guy Heating and Air Conditioner maintenance program. Keep your home comfortable with reliable furnaces from American Standard. 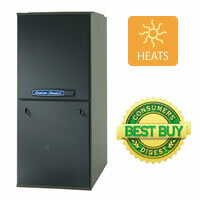 We have a variety of options available, that all provide energy-efficient, cost-effective warmth to your home.